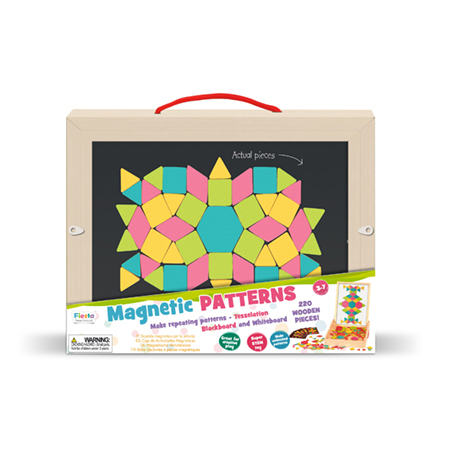 This Magnetic Activity Box contains 220 magnetic wooden pieces that children can play with and turn into amazing patterns and pictures. Let their imaginations run wild as they place all the colourful pieces made up of different shapes together in any way they want ? the pieces can also be tessellated. There are even pattern example cards for inspiration. Children can use the magnetic double sided lid to create their masterpieces, choosing either the chalkboard on one side or the whiteboard on the other. Additionally, everything can be stored and easily transported in the box itself, which sports a useful carrying handle. STEM toy; learn geometry and tesselation. Super travel toy; all packs up neatly into case.